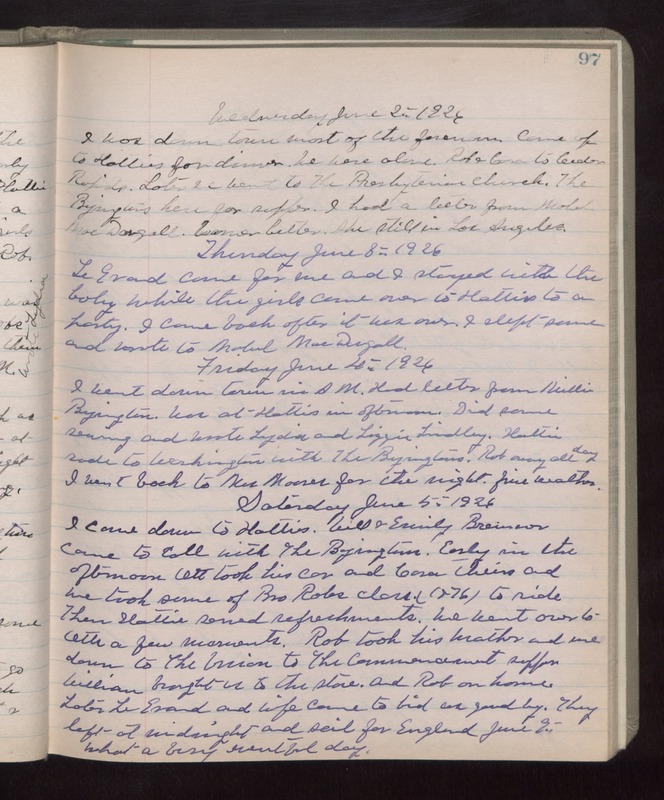 Wednesday June 2nd 1926 I was down town most of the forenoon. Came up to Hatties for dinner. We were alone. Rob & Cora to Cedar Rapids. Later we went to The Presbyterian Church. The Byingtons here for supper. I had a letter from Mable MacDougall. Warner better. She still in Los Angeles. Thursday June 3rd 1926 LeGrand came for me and I stayed with the baby while the girls came over to Hatties to a party. I came back after it was over. I slept some and wrote to Mabel MacDougall. Friday June 4th 1926 I went down town in AM. Had letter from Millie Byington. Was at Hatties in afternoon. Did some sewing and wrote Lydia and Lizzie Lindley. Hattie rode to Washington with The Byingtons. Rob away all day. I went back to Mrs Moores for the night. Fine weather. Saturday June 5th 1926 I came down to Hatties. Will & Emily Bremner came to call with The Byingtons. Early in the afternoon Ott took his car and Cora theirs and we took some of Bro Robs class (1876) to ride. Then Hattie served refreshments. We went over to Otts a few moments. Rob took his Mother and me down to The Union to The Commencement supper. William brought us to the store and Rob on home. Later LeGrand and wife came to bid us good-by. They left at midnight and sail for England June 9th. What a busy eventful day.